A tall pub just by Farringdon Station. It's part of the Mitchells & Butlers Castle sub-chain. Inside, the pub is laid out over several levels, getting very dark towards the back, where a medium-sized space holding 15-20 can be booked. The front part has tables at a couple of different heights, and upstairs is a spacious and fairly bright room facing the street, which is sometimes empty even when the rest of the pub is busy and makes a particular pleasant environment for a drink. 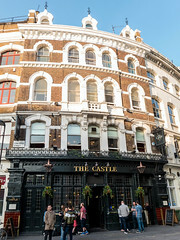 Being part of the Castle chain means they have a good range of beers and wines available, including Sierra Nevada and a couple of handpulls for ale (London Pride and one other on a September 2009 visit). They were running low on champagne on Ewan's visit on a Saturday evening, but that's a problem unlikely to afflict most visitors. Food is served noon-10pm daily. Food is from the standard menu at this chain, with excellent crispy nachos, and a good selection of other familiars. Last visited by Ewan, Jo and others, 26 September 2009. Opening hours and food times taken from website, October 2009. Last edited 2015-03-11 12:34:52 (version 7; diff). List all versions. Page last edited 2015-03-11 12:34:52 (version 7).